Pentax has released their Pentax Optio V20 digital camera. 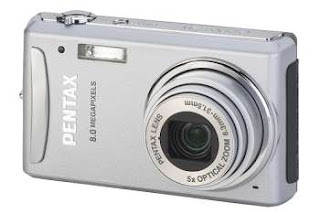 The Pentax Optio V20 digital camera features 8 mega pixel resoltuion, 5x optical zoom, and a 3.0 inch LCD screen. The Pentax Optio V20 incorporates some new technologies which can also be found on some Sony Cyber-Shot digital cameras. The Pentax Optio V20 has a face recognition feature which can detect and focus on faces and then automatically sets the exposure settings. The Pentax Optio V20 also has smile detection technology. The blink detection technology on this digital camera will immediately alert the user when the subject closed their eyes during the shot so you can do a retake. Other features of the Pentax Optio V20 includes 52mb built-in memory, Auto-tracking AF and Auto-Macro mode. The Pentax Optio V20 will be available in May for $279.95. I like the idea of the smile technology because in my photos I always end up taking shots when my friends and family aren't.